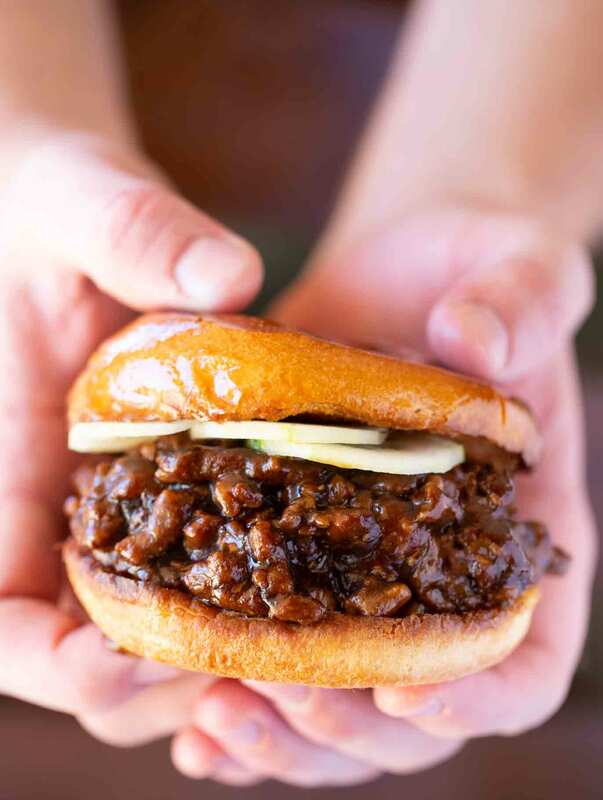 Teriyaki Pork Sloppy Joes made with ground pork and teriyaki sauce are the PERFECT combo of sweet and messy on a toasted brioche bun, ready in only 20 minutes! Another week, another addition to the popular Sloppy Joes series! And just in case you missed it, here’s my Korean Beef Sloppy Joes and BBQ Sausage Sloppy Joes, both variations on my most popular recipe Ultimate Sloppy Joes. 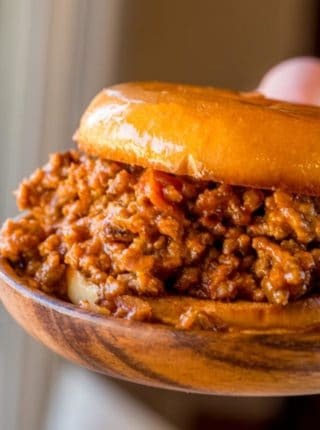 We’re more than half way through our sloppy joes series, and honestly we still haven’t run out of ideas! 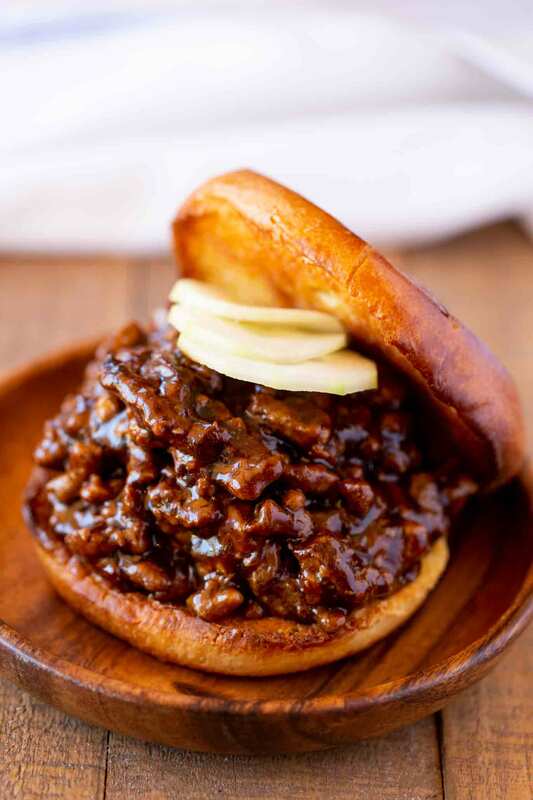 We’re sloppy joes inspired, and I’m super excited about this week’s Teriyaki Pork Sloppy Joes. 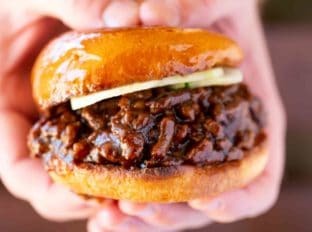 Teriyaki Pork is a recipe I’ve made MANY times over the years for clients, and now I love making these sloppy joes for my family because they’re super kid-friendly. Teriyaki Pork Sloppy Joes are a combo of sweet teriyaki mixed with ground pork and cooked in a messy sauce with carrots and garlic. Just like the classic teriyaki dish, we’re topping these with scallions and cucumber, after piling it high on a buttery toasted brioche bun. Seriously, teriyaki pork sloppy joes are the things that dreams are made of. Sweet, savory dreams. Sloppy joes are EASY to meal prep for the week, and perfect for busy schedules! Brown the meat and veggies in the sauce, but set some of the sauce aside in a container (or even better, make some extra sauce). Cook the meat through, but stop when the sauce is still pretty thin. It will thicken later. When ready, reheat the meat in a skillet with 2-3 tablespoons of water, and the reserved sauce. Serve as normal with cucumber, scallions, and freshly toasted buns. Use a large skillet with some oil and garlic to brown the pork until almost cooked through. Add to slow cooker. Stir in carrots and sauces. Whisk together broth and corn starch. Pour over pork and close lid to slow cooker. Cook on high for 4 hours, or low for 8 hours. When it’s done, top with cucumber and scallions. Butter and toast your buns, then scoop evenly onto each and serve. 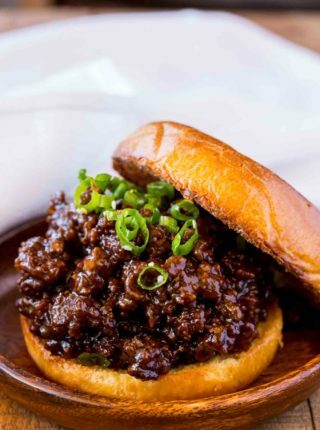 If you don’t want to serve on buns, you can serve teriyaki pork sloppy joes over rice instead! It’s important not to overcook the sauce, otherwise too much water will cook off and your joes won’t be sloppy enough. Stop when you see the sauce just start to thicken. It will continue to thicken a little more as it cools down . You can make this recipe with ground chicken or beef, both meats go well with teriyaki sauce. Butter and toast the brioche buns so they’ll hold up to the moisture in the sauce without breaking apart. Prep your ingredients before you start cooking so the pan doesn’t burn on the bottom while you’re trying to chop. Add the canola oil and carrots to a large skillet on medium heat and cook for 5-7 minutes until softened and just starting to brown. Add in the garlic and pork and cook, crumbling while cooking until browned, about 5-7 minutes . Add in the teriyaki sauce, chicken broth, hoisin sauce and cornstarch and whisk well before the cornstarch starts to clump in the heated sauce. Cook for 4-5 minutes until sauce is reduced and spoon onto brioche bun and top with green onions or cucumber slices. Well, now I’m totally craving a big sloppy sandwich! That sauce is amazing!!! 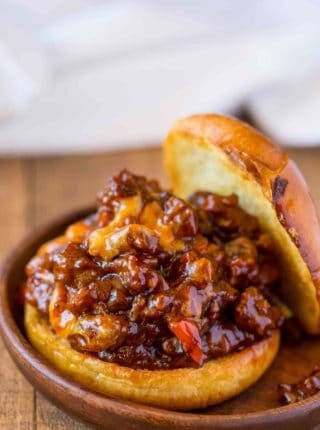 I love this twist on sloppy joes! I love changing things up! 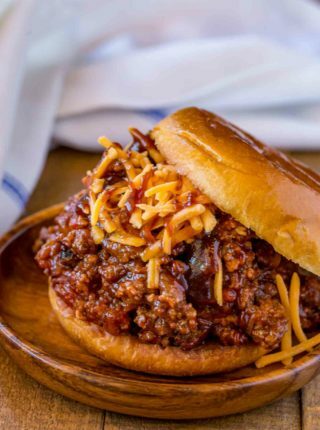 I am officially obsessed with these Sloppy Joes! The best idea ever!